How many times has your cell phone run out of juice in the middle of an important call? Too many. 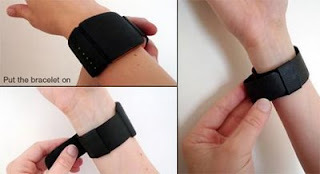 A team of designers, however, thinks it may have come up with a way of generating enough electricity to jolt your cell phone’s dead battery back to life to finish that all-important call – an energy bracelet that uses body heat and ambient temperature. We’ve covered some novel ways of generating electricity on the move – most recently, we looked at a device called Etive, which harnessed the vibrating, shock forces at the knee, while walking. And of course there are various solar-charging options and one using wind. 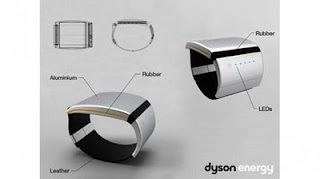 Now we can add the Dyson Energy Bracelet to the list. 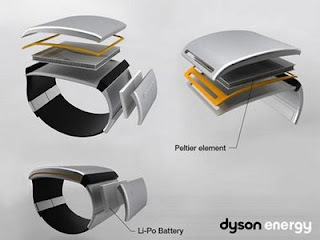 Entered into this year’s James Dyson Award, the bracelet converts the temperature difference between the skin’s surface and the ambient air to produce electricity that is then stored in a battery. This thermoelectric effect is known as the Seebeck effect, on account of the person who discovered it. 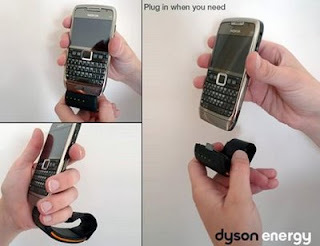 When the cell phone, or any other mobile device, needs sudden recharging, it is plugged into the functional-looking bracelet – which rather unfortunately reminds one of those home detention devices worn round the ankles – via a micro-USB port (to be introduced in 2012). At this stage, the designers – Mathieu Servais, Camille Lefer, Clément Faydi and Mickaël Denié – are proposing that the bracelet gives a cell phone a burst of electricity, which provides those crucial extra minutes of talk-time, but it is not intended to provide a full recharge. In coming up with the idea of the bracelet, the designers tested a Peltier element by creating heat and cold on the same component and found, though the Seebeck effect, that electricity was produced.